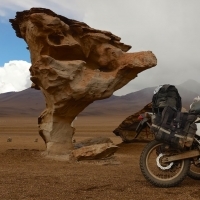 In March 2015 we rode the “Lagunas Route”, a multi-day trip through rugged terrain between Uyuni in Bolivia and San Pedro de Atacama in Chile. 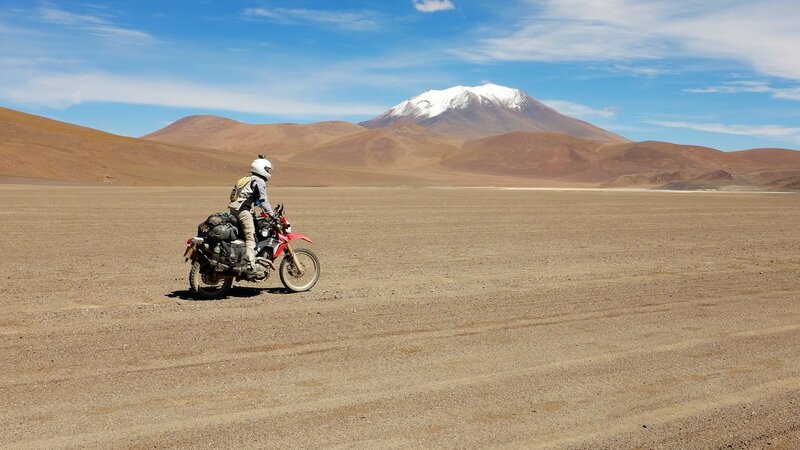 For us it was the most beautiful long distance offroad trail we rode in South America. It was a definite highlight of our trip! Click here to see our pictures. We hope the information below helps you to prepare for the Lagunas Route, so you can see this amazingly beautiful part of Bolivia yourself. 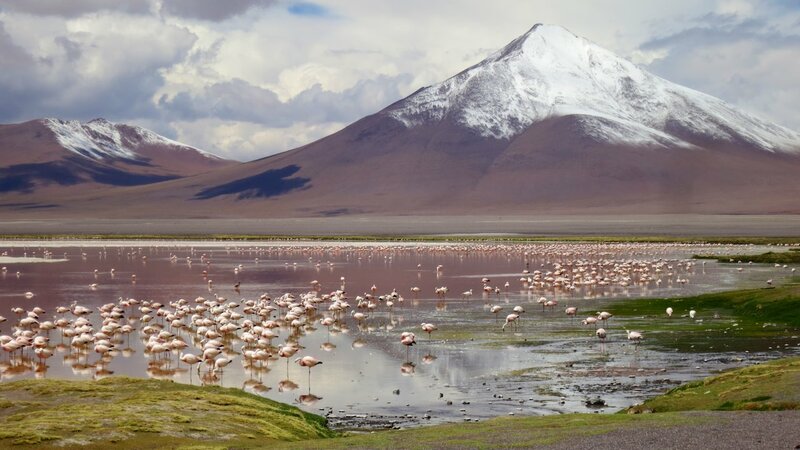 There are basically three ways to ride from Uyuni (Bolivia) along the lagunas to San Pedro de Atacama (Chili). 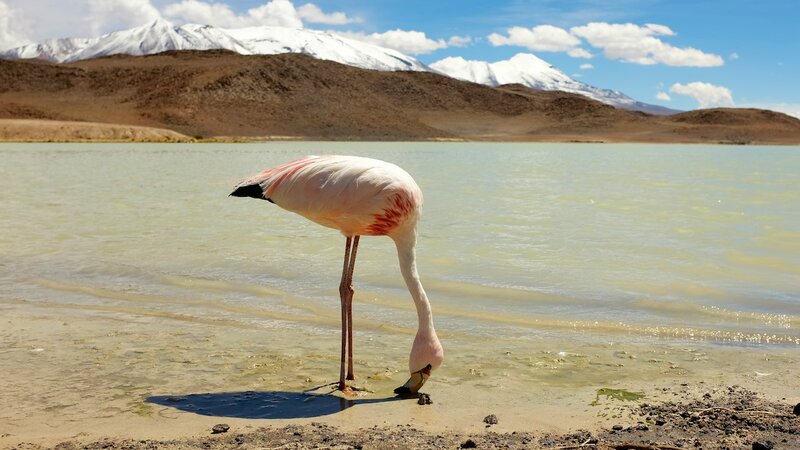 The first part from Uyuni to Villa Alota and the last part from Laguna Colorada to the Chilean border is the same for all three routes. It is just the part in the middle that is different. On the little map the three routes are marked in different colours. The main differences between the three routes are: -the state of the road/track; -the difficulty of the track; -the lagunas you can visit; -the places to stay/camp. Directions = Uyuni – Vilavila – San Christobal – Villa Alota. Turn left in Villa Alota off the main road, head south towards Villa Mar. You will pass Laguna Vinto just before you arrive in Villa Mar. Continue south towards Quetena Chico. From here you start riding west, where you will enter the national park and ride to Laguna Colorada. From Laguna Colorada you start riding south towards the border with Chili. Along the way you will pass: the geysers, Laguna Chalviri, Hotsprings, Desierto de Salvador Dali, Laguna Verde and Laguna Blanca. You leave the park, ride to the customs/immigration office and shortly after that will arrive on the tarmac road to San Pedro de Atacama. Directions = Uyuni – Vilavila – San Christobal – Villa Alota. Keep following the main road to the west, through a valley with beautiful rock formations. 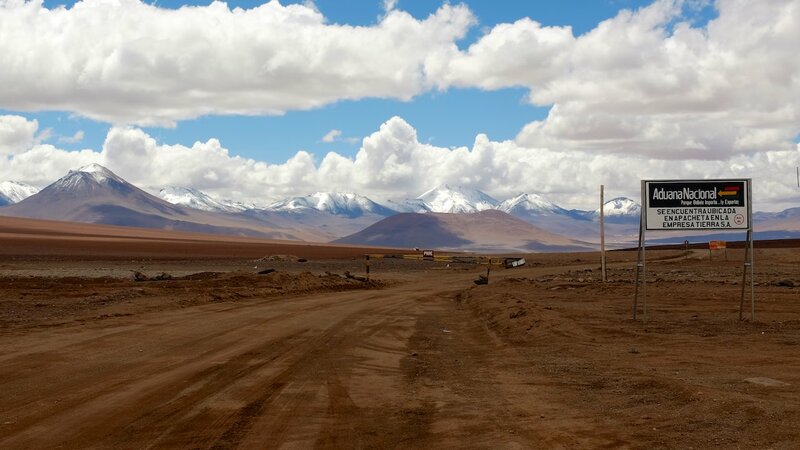 (You will pass the dirt road that leads to Laguna Chulluncani, see Route C) After about 40 km you reach the turn off to the south (S21 24.089 W67 59.118). Start riding south towards Laguna Canapa, Laguna Hediona, Laguna Chiar Kkota, Laguna Honda, Laguna Ramaditas and finally Laguna Colorada. Just before Laguna Colorada you will pass the Arbol the Piedra. From Laguna Colorada you start riding south towards the border with Chili. Along the way you will pass: the geysers, Laguna Chalviri, Hotsprings, Desierto de Salvador Dali, Laguna Verde and Laguna Blanca. You leave the park, ride to the customs/immigration office and shortly after that will arrive on the tarmac road to San Pedro de Atacama. Comments: This is the route that most touroperators take in their 4×4 cars. You will see all the most beautiful lagunas. In addition to the sites you will see south of Laguna Colorada, you will also see the Arbol de piedra. We met travellers on motorcycles that took this route and told us it was OK and good to ride. 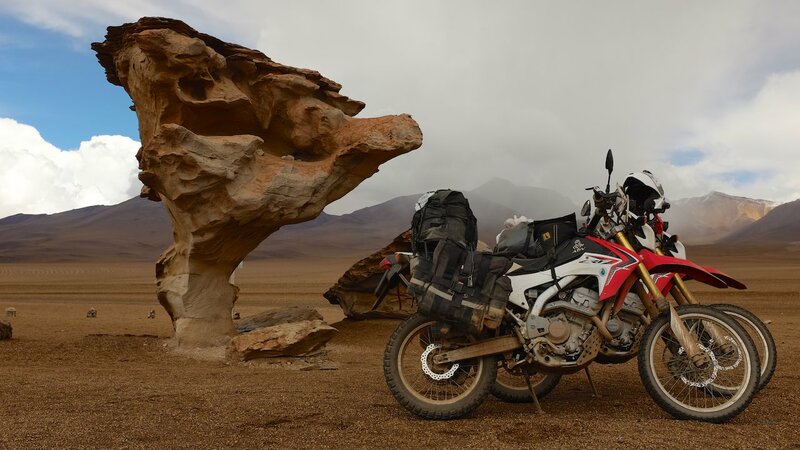 They were riding a Honda Africa Twin, a Transalp and a KTM 450EXC. 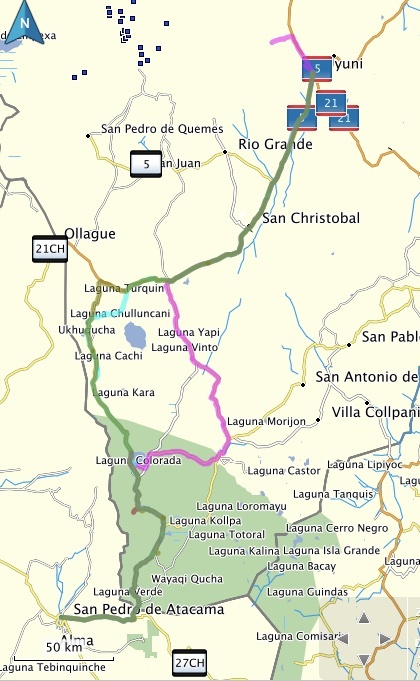 Directions: Uyuni – Vilavila – San Christobal – Villa Alota. Keep following the main road to the west, through a valley with beautiful rock formations. After about 28 km after Villa Alota turn left onto a gravel road (at S21 26 45.5 W67 50 42.1) and start riding south towards to Laguna Chulluncani. The turn off is marked by old car tires that are painted white and red. After about 11 km you will reach Laguna Chulluncani. 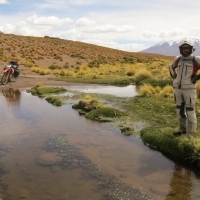 Start riding west again to go to Laguna Hediona, which is about 18 km from Laguna Chulluncani. Start riding south again, to Laguna Chiar Kkota, Laguna Honda, Laguna Ramaditas and finally Laguna Colorada. Just before Laguna Colorada you will pass the Arbol the Piedra. From Laguna Colorada you start riding south towards the border with Chili. Along the way you will pass: the geysers, Laguna Chalviri, Hotsprings, Desierto de Salvador Dali, Laguna Verde and Laguna Blanca. You leave the park, ride to the customs/immigration office and shortly after that will arrive on the tarmac road to San Pedro de Atacama. Comments: We thought the route was overall in good condition. Only the part between Laguna Chulluncani and Laguna Hedonia was rough, with deep tracks and loose rocks. The water crossing was not very deep and doable on the bikes. 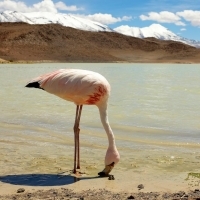 We liked the visit to Laguna Chulluncani because we were alone again (after having seen about 30 4×4’s parked at Laguna Hediona, but we came from the south. Coming from the north that might be different). If you do this option in a car you need high ground clearance. Laguna Chulluncani is nice, but definitely not the most beautiful laguna. If you take this route, you will see all the most beautiful lagunas. In addition to the sites you will see south of Laguna Colorada, you will also see the Arbol de Piedra. We took 25 liters of fuel each, but did not need everything to finish the track. 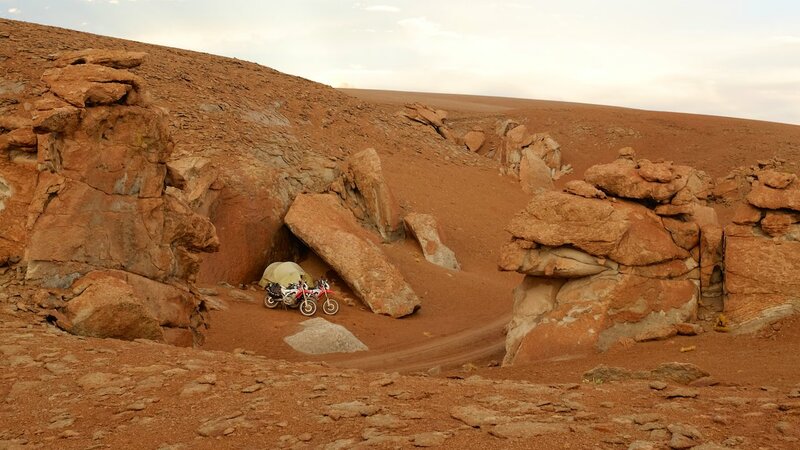 We found fuel (gasoline) in Uyuni, Villa Alota and San Pedro de Atacama. 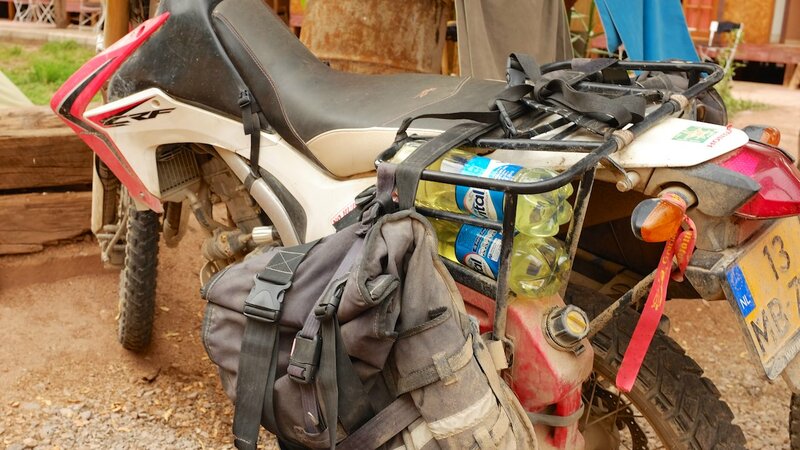 The fuel we bought in Villa Alota was from a local selling from his garage for 7 Bolivianos per liter. (See Track Amsterdam to Anywhere for the waypoint). There should also be a fuel station in San Christobal. Most touroperators drive a 4×4 that uses gasoline. They all carry a lot of spare fuel with them, so in case of an emergency you could always ask them. We do not know if it is as easy to get Diesel on the route. In Bolivia fuel is very cheap (3 Bolivianos per liter), but if you are riding a vehicle with a foreign number plate you have to pay more (8.68 Bolivianos per liter) and the owner of the fuel station has to write a bill, “a factura”. As this is a lot of work, some fuel stations will just say that they do not want to sell to you. Ask if they can sell the fuel ’sin factura’ and bargain for a better price. 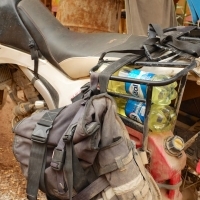 For us this has worked most of the times, and we bought fuel for 5 to 7 Bolivianos per liter. 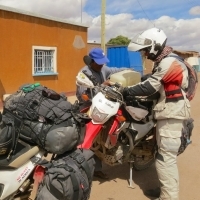 Park out of view of the camera’s at the fuel station, empty your jerrycan in your bike and have them fill the jerrycan instead. This has worked a few times, and we could then pay the original Bolivian price. There are a few refugio’s along the route where you can spend the night. Otherwise bush camping is a good option. Just make sure you find a place that is covered from the wind, because the wind can be very strong! 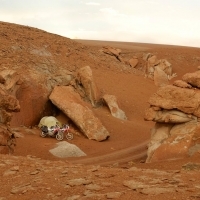 We heard of people that, depending on the route, rode in two days from Uyuni to San Pedro, thus spending only one night on the route. This was in a car or on a motorbike. It takes cyclists upto 14 days(!) to ride the route. We took 4 days to ride the route and spend three nights camping, because it was so beautiful. We wanted to stay as long as our food supply could take us. Part of the route goes through a National Park for which you have to pay an entrance fee. You will find the gate just north of Laguna Colorada. Price is 150 BOB per person. At some of the Lagunas and Refugios along the route you can buy basic supplies, like pasta, cookies and water. There are a few restaurants for basic meals at the refugio’s. The prices are obviously very high. We took enough food for 4 days and packed as if we were hiking. For dinner only pasta with a package of soup (If you do not use a lot of water, it will be a pasta sauce:)) For lunch we bought two packets of 10 tortilla wraps, boiled eggs and jam. For breakfast we took powdered milk and oats. IMPORTANT – DO NOT FORGET TO VISIT THE CUSTOMS OFFICE OF BOLIVIA!! 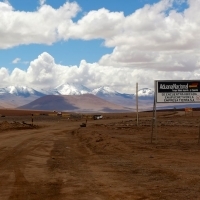 Coming from the North, you will pass the Bolivian customs office where you have to get the exit stamps for your vehicle first. It is a bit hidden. 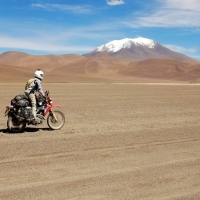 Make sure you do not miss it, because if you arrive at the Bolivian immigration office later, there is a chance they might send you back – the full 80 KM! 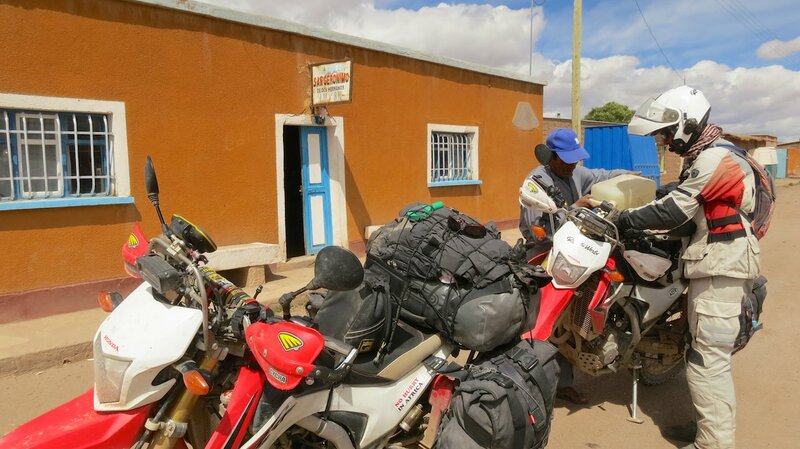 We came from the south when we rode the Lagunas Route and were able to finish all the paperwork, also for the motorbikes, at the immigration office. Just check what the current status is before you leave. Go to the hotspring (see waypoint) for a dip. The water is 37c and is GREAT! In the afternoon you will have the hot spring to yourself, maybe with one local doing laundry:) In the morning you want to leave, because then there are over 20 land cruisers with lots of tourists in the pool. You can even stay the night there (we slept in the restaurant on the floor:) for 10Bob per person. 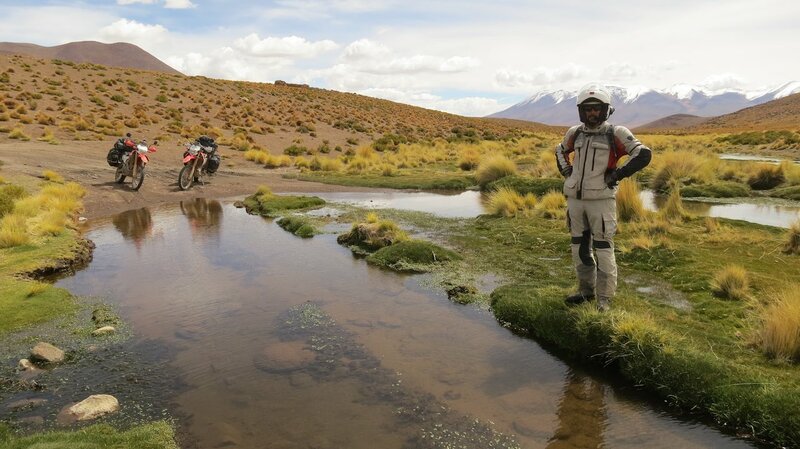 GPX-file: “Lagunas Route A” which is the track of our friend Gilles, who rode it on his BMW R1200GS. 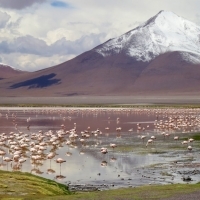 The track also includes a visit to the Salar de Uyuni. GPX file: “Track Amsterdam to Anywhere” INCLUDING WAYPOINTS. We still have to figure out how we can make these GPX-files available on the website for you to download. Until then, just send us an email at leonie@amsterdamtoanywhere.nl if you would like to receive the GPX-files.